Why does Picasa Web Albums not show location data from my GPS camera? Your camera writes GPS geographic coordinates to the metadata of your photos. This location information may be stripped out during upload to the web or might not show due to your privacy settings in your Picasa Web Albums. First make sure that there is indeed location data in your picture files. Check your camera settings to make sure that the GPS data is recorded. After importing photos to your computer, right-click on a file name, select Properties. On the Details tab scroll down. GPS data is shown below the Advanced Photo section and above the File section. It should look somewhat like the image on the right. 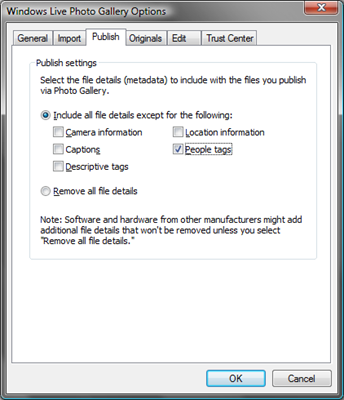 If you are using Windows Live Photo Gallery to upload your files to your Picasa Web Albums, check the Publish settings. Click the blue File tab, select Options, then click the Publish tab. Make sure that the “Include all file details except…” option is selected. Note that any boxes checked means that the information is removed from the file before it is uploaded. So make sure that Location information is not checked. If you use another program to upload your files, check its settings to make sure that the GPS data is not removed. Many programs remove such data by default to protect the users. 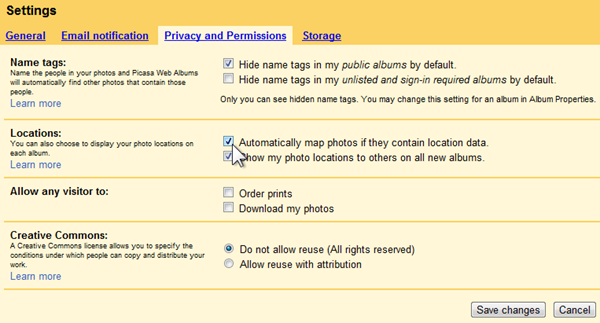 Once you have made sure that the information is uploaded, sign in to your Picasa Web Albums. In the upper right click on “Settings” or the little gear symbol (the appearance is different in some browsers), click on Photo settings. On the Settings page, click the Privacy and Permissions tab. On this page you can specify a number of options. To display the location data, click on Automatically map photos if they contain location data so the check mark shows. Click Save changes. Your photo locations should now be displayed for all photos that contain GPS data. Be extremely careful about showing location or other information that can be used by criminals to bring harm to you or others. Clear GPS and other sensitive metadata from pictures that could be misused before uploading them.